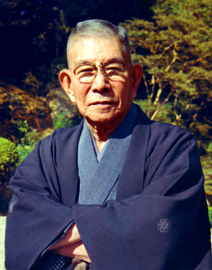 Tempū Nakamura (中村天風, July 20, 1876–December 1, 1968) was a Japanese martial artist and founder of Japanese yoga. He was the first to bring yoga to Japan and founded his own art called Shinshin-tōitsu-dō (心身統一道, lit. way of mind and body unification), and taught it at Tempu-Kai that he established. In this Japanese name, the family name is Nakamura. 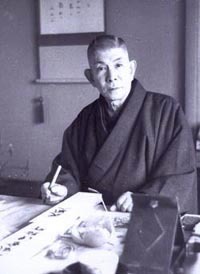 Born in Tokyo, Japan, his original name was Saburō (Japanese: 三郎). He was the son of Sukeoki Nakamura(中村祐興 1829-1909) of Fukuoka Prefecture and Teu Nakamura (中村テウ 1858-1928) of Tokyo, known as Edo at the time. His father introduced the use of paper money in Japan when he served as the bureau director of the Japanese Ministry of Finance. Tempū Nakamura later moved to Fukuoka (福岡市, Fukuoka City), Fukuoka Prefecture (福岡県) to live with a relative. Once there, he took private lessons from an Englishman and enrolled in the Shūyūkan (Japanese: 修猷館, now Fukuoka Prefectural Shuyukan Senior High School in Sawara-ku) school where English was the medium of instruction and where he became proficient in his family's style of judo (随変流) and also trained in kenjutsu and iaijutsu. During judo practice, he totally defeated an opponent from Kumamoto who then tried to kill Nakamura in revenge. In the violent encounter, Nakamura stabbed and killed his assailant, which was ruled legitimate self-defence. He left the school and joined Gen'yōsha ultra-nationalist secret society, forming a friendship with Tōyama Mitsuru. At the age of 16, he joined the Imperial Japanese Army and served as a covert agent in Northern China. China was reigned by the Manchu dynasty at that time. He was one of only nine out of 113 military affairs investigators to return to Japan alive from the Russo-Japanese War, after which he suffered a severe attack of tuberculosis at the age of 30. Seeking a cure for the illness, he studied the autonomic nerves at Columbia University, and traveled to England, Germany, Belgium and France. For a period of time he lived with the family of Sarah Bernhardt. In 1911, on his way back to Japan, he met an Indian yogi in Egypt named Kaliapa (a.k.a. Cariapa and Kariappa), who took him to Gorkhe, in eastern Nepal. He remained there for two and a half years of yoga study and practice, which incidentally cured his illness. He practiced a variation of Raja Yoga and Karma Yoga with Kaliapa, with an emphasis on Raja Yoga. After finally returning to Japan, he served as president of Tokyo Industrial Bank, among other business activities. He established his own medical and philosophical organization in 1919, renaming it Tempūkai (Japanese: 天風会) in 1940. He taught Shin Shin Tōitsu-dō to Tōhei Kōichi, who later founded Shinshin-tōitsu-aikidō. He died in 1968, and was buried in the cemetery attached to Gokoku-ji, Tokyo. In Japan, Tempū is remembered as a prolific writer and a practitioner of philosophy and entrepreneurship. Tempu-Kai is headquartered in Otsuka (大塚), Bunkyo-ku, Tokyo, and actively holds seminars and retreats to teach his Shinshin-tōitsu-dō. It has branches all over Japan and overseas, such as in Hawaii. Tempu made considerable influence to the leaders of the Japanese society in variuous fields. They include: Tōgō Heihachirō, Hara Takashi, Seibo Kitamura, Chiyo Uno, Futabayama Sadaji, Tatsuro Hirooka, Konosuke Matsushita, Kazuo Inamori, et al., and more recently, Shohei Ohtani.